1.Cut a piece of backing paper to cover the front of your card blank and stick down to the card. 2.Cut a piece of white cardstock to 11.5 x 16.5cm, die cut a butterfly shape in the centre. 3.Adhere acetate behind the butterfly aperture, Add foam tape around the butterfly, add sequins inside of the tape, adhere a piece of printed backing paper to the top, to keep the sequins secure. 4.Adhere this to the card blank adding foam tape to the top and bottom of the card, to secure it to the card. 5.Die cut a butterfly using the same one used to create the aperture. Adhere to the centre of the aperture, leaving the wings free. 6.Adhere a few other smaller butterflies to the front of the card then finish by adding some sequins to the front. 1.Remove the glass and cover the inside of your frame with the Santoro 12x12 paper. 2.Wash and dry your twigs, when dry glue them to the back of the frame using a strong glue or glue gun. 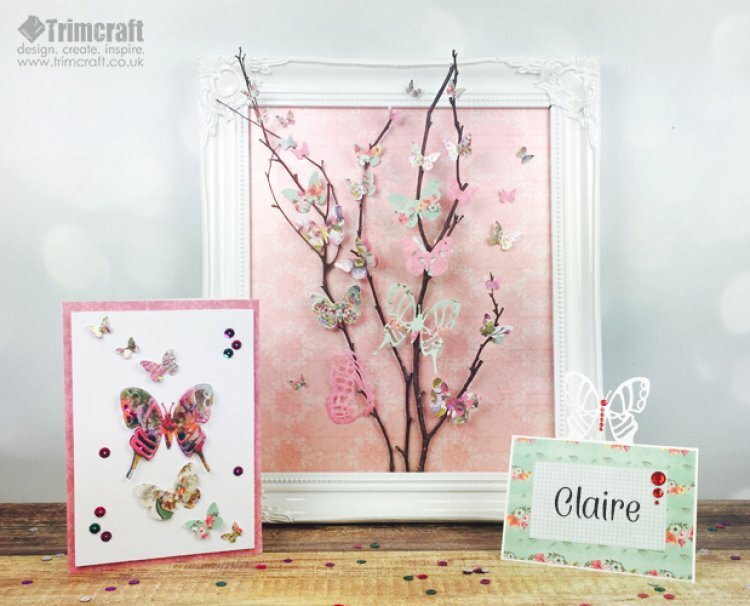 3.Die-cut a variety of different butterflies in a selection of different printed papers, layer some together for dimension and them glue them onto the twigs. 4.Add a few smaller butterflies to the backing paper, glue the in the centre so their wings are free to bend back to add extra dimension. 1.Cut a 5x7 card in half, place the large butterfly die in the centre of the card and die cut, put the paper though the die machine head first but stop before the whole die goes through your machine. 2.Score the card in half along the bottom of the butterfly; fold the extra cut piece to the back of the card leaving the pop up butterfly. 3.Cut a piece of paper to cover the front of the card and add a section to write your guests name. 4.Add gems to the body of the butterfly. Top Tip: This would also make a cute little card. We love these 3 different ways of using your dies, how would you use them on your craft projects? We love to see your creations so don’t forget to upload and share your die cut creations in the inspiration area. I´ve always loved butterflies, but never seen these, so I can see, that I have to ask in my craftstore, if they can´t get them for me, as they looks amazing, and I just LOVE these ideas here, so would love to give them a try sometime, that´s for sure. I have a little request for you too. When you list the things you used on the makings here, if you could add the number of the product used, then it´ll be much easier for us to find them, and also when we need to ask our craftstore to take something home, cause they don´t always know, what we´re talking about, if we just say the butterflyset, as there might be more different sets maybe, so it would be a huge help, if you would do that.